The Globe Theatre's Young Hearts season continues with what many call Shakespeare's most modern play, Troilus and Cressida. Modern perhaps being a euphemism for difficult, but we'll come to that later. If you know your Greek (or your Brad-Pitt-in-sandals vehicles), you'll instantly recognise a fair few of the names, even if you don't know the eponymous two. 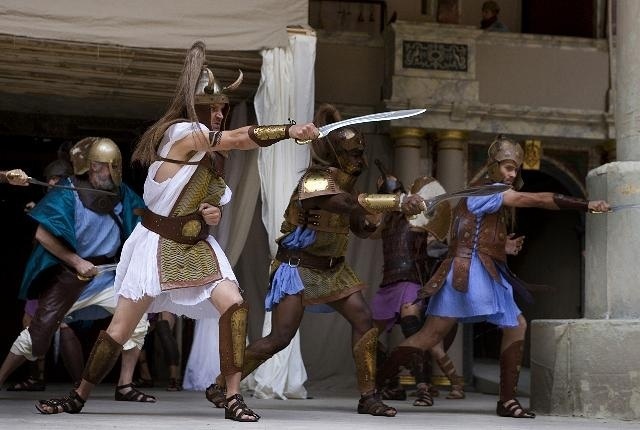 Here's Agamemnon, Ulysses, Achilles and Ajax, the Greek heroes all riled by Paris, a Trojan, nicking off with Menelaus' pretty wife Helen, and setting up the war to start all wars. There's even that doom-predicting Cassandra, who Apprentice-watchers will spot a mile off. Shakespeare's soldiers, however, bear little resemblance to their uber-heroic namesakes from Homer's Iliad. These boys are petty, divided, vain, arrogant. As they stalk around the stage in their frankly effeminate sky blue and lilac skirts (no amount of interesting blackened tattoos and leather strapping can make up for the fact they've all sculpted their hair) we soon realise both sides are bored of this futile war. Achilles (the brilliant Trystan Gravelle), supposed great warrior of the Greeks, wanders around in make-up and a dressing gown, his Welsh vowels drawling laziness, hanging out with a very gay Patroclus, and worse still, determined not to fight. The Troilus and Cressida bit is woven around these bigger characters. 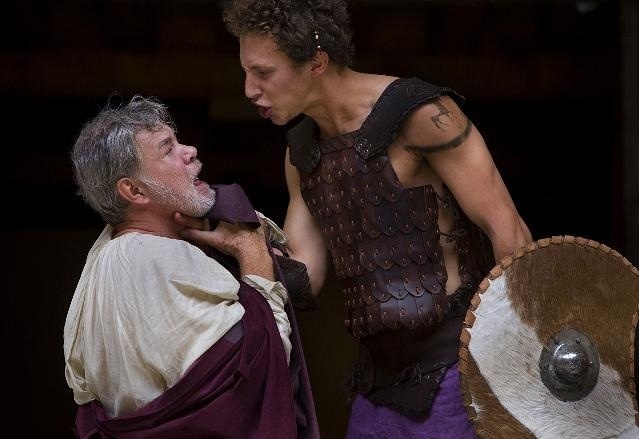 Troilus (Paul Stoker, very fit, very capable) tells a terribly camp Pandarus (Matthew Kelly), he fancies one of the girls on the other side, Cressida. Acting as a go-between, Pandarus sets up a meeting for the two lovebirds. There's no marriage talked about (one of many modern touches) but they promise to be true to each other. This is all scuppered when Cressida is used as a bargaining pawn to free a Trojan captive. She's sent to the Greek camp, and quickly proves one soldier's affections are as good as another's when you're a girl stuck in an army on your own. Laura Pyper's Cressida is utterly charming; her gorgeous cropped hair with purple streaks, jokey Mancunian twang, and refreshingly modern attitude makes us feel there's one of The Saturdays chatting about stars on the red carpet at the Oscars with Matthew Kelly while she's taking the piss out of the Greek heroes below her. She's clearly smitten with Troilus; there's a lovely moment when she burbles about her fears of revealing too much to the man she loves. Matthew Kelly also deserves a mention. He's clearly having a great time with a peach of a part. 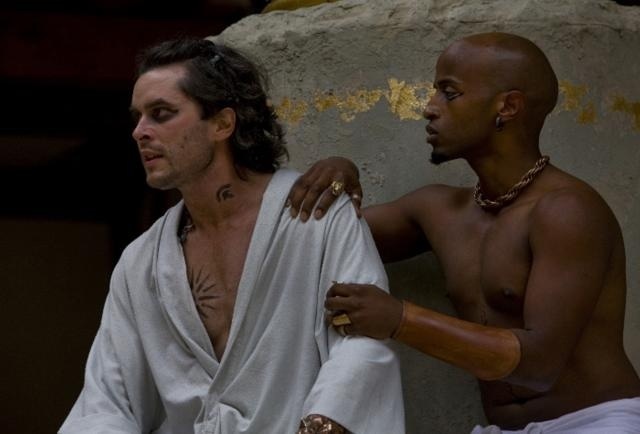 His Pandarus contains just the right amounts of sympathy and revulsion we should feel for such a flawed character. When he wails about the younger "generation of vipers," we can't help but wonder where the earlier, lighter play disappeared to, and feel tragedy bearing down on us. And is it just us, or does Kelly deliver his barbed epilogue as a near-perfect King Lear audition? Altogther, Troilus and Cressida is a big show for The Globe. You get a lot for your money: a huge ensemble, with no weak parts; a sublimely slutty WAG in Helen, when she finally appears; bear chests, bloodied arms and proper sword fighting; a doomed love story; great language, of course; and very clever comedy from a revolting fool, Thersites. What you don't get is any resolution. We hope we're not spoiling it to tell you neither Cressida or Troilus dies at the end of their tragedy (more breaking with dramamtic traditions). Nor do you get many sympathetic characters. What you do get is a great slice of life, messy, dramatic and pretty gripping. Troilus and Cressida, rarely performed until the 1920s, comes across as a great modern play with a troubling ancient story. 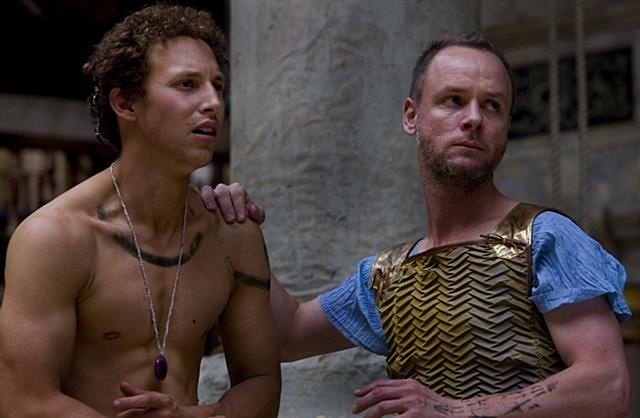 Troilus and Cressida is on at Shakespeare's Globe Theatre until 20 September. Tickets from £5. See www.shakespeares-globe.org for more information.